Costa Rica is home to all kinds of Snapper species: Cubera, Red, Mullet, Colorado, Dog-Tooth, Silky, Yellow, Rock and many more. Anglers fishing Costa Rica inshore will find these beautiful – delicious! 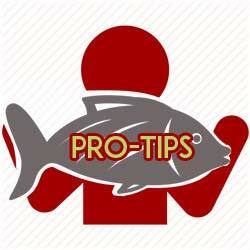 – often wary and cautious fish usually around rocks, reefs, ledges and other structures close to shore. Snapper can be caught all year round off Costa Rica’s Pacific and Caribbean coasts, but it is the Pacific coast where these fish truly abound. All Snapper species eat crabs and shrimps, smaller fish and minnows, and octopus. And, of course, every species of Snapper caught on Costa Rican sport fishing charters is a delicacy at the dining table. 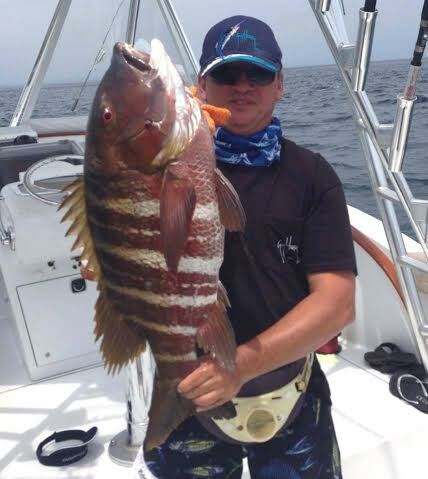 The biggest Snapper that anglers who fish Costa Rica will encounter is the Cubera Snapper. This slow-growing and long-living fish is a trophy catch. 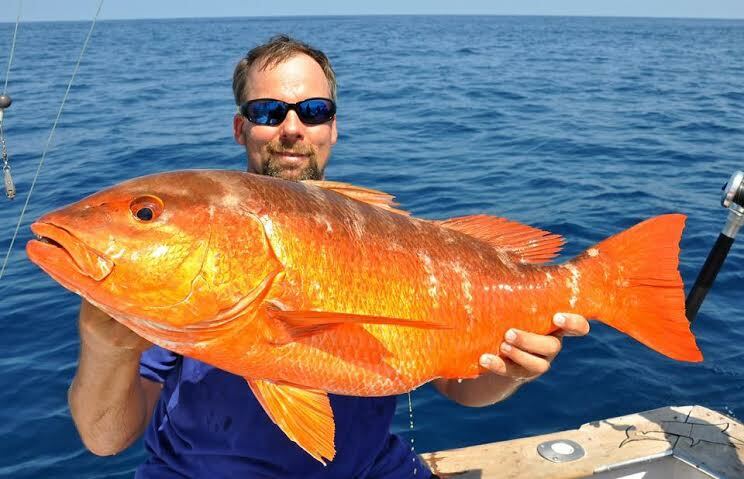 Cubera Snapper can reach over 100 pounds, and live over 60 years. Cubera Snapper prefer rocky structures and reefs, with lots of holes and ledges to hide in. Anglers on an inshore Costa Rica fishing charter will catch them live baiting around rocky points and reefs, although on deeper reefs, drifting a small dead tuna with the backbone removed is effective bait, as are live lobsters and crabs. When hooked, Cubera Snapper are tough, determined fighters, and a heavy drag is needed to stop them before they break you off. Mullet Snapper are a longer, sleeker Snapper that often congregate in large schools, and sometimes can be seen boiling bait on the surface. They are strong, energetic fighters, and will often attach baits and poppers cast in their vicinity. The term Pacific Red Snapper encompasses several species (Silky, Colorado, Spotted Rosy…) and average between five and 20 pounds. All of these fish are prize catches on a Costa Rica sportfishing charter, and are delicious. Another tasty Snapper is the Yellow Snapper, which anglers enjoying a Costa Rica fishing day will encounter near rocks and ledges. Yellow Snapper are usually reddish brown on the front, fading to bright yellow on the rear fins. Rarely will you find one more than 10 lbs. A more unusual Snapper often encountered when fishing Costa Rica is the Rock Snapper. What distinguishes them is that they are olive green, not the usual variation of red coloring shared by other Snapper species, and have alternating light and dark vertical bands. Rock Snapper also have two ‘feeler’ antenna-like structures protruding from their upper jaw. Rock Snapper, usually three-15lbs, hang around holes and ledges, and will run to the hole when they feel the hook. They are fairly weak fighters, but truly excellent eating. Finally, you will be lucky if the whole fried Snapper you order at a seafood restaurant in Costa Rica is a Spotted Rosy Snapper. 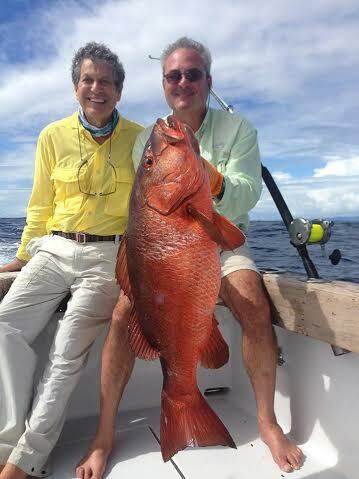 Although they can reach five pounds, most Rosy Snapper caught by anglers fishing in Costa Rica are less than a pound. It is absolutely scrumptious! 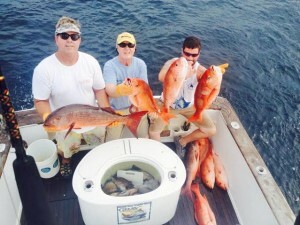 Spotted Rosy Snapper are often caught while bait fishing for Blue Runners. They are aggressive eaters and school, and 10-20 can often be caught in a short time.